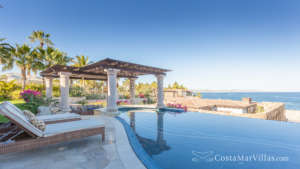 Not much else can compare to the warm Los Cabos sun, an ice-cold drink in one hand, and pristine white sands on your feet, at the Casa La Laguna beachfront. 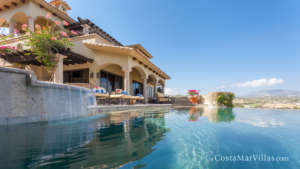 From its friendly and professional staff to the convenient location to fishing, golf and the downtown San Jose del Cabo, this vacation rental in Cabo San Lucas offers an outstanding luxurious experience. Bring your family and friends for a memorable beach getaway or allow the stunning ocean views become the backdrop for a unique wedding destination or a business-retreat. During the duration of your stay, you will be treated to full staff that includes an in-villa concierge, a butler, gourmet chef and an in-house masseuse. You can decide on relaxing on the terrace in a comfortable lounge chair or chase a few thrills on a slide between 2 levels over the pool. When the sun starts to set, turn up the available sound-system and enjoy a cocktail on the terrace served by your butler, while you enjoy al-fresco dining. At night experience stargazing in a hot tub or sit around the firepit enjoying quality time with your family. You can also choose to go inside where you can use the home theater to watch a moving or unwind with one of the sessions located inside the private-spa. This villa combines a classical Hacienda style along with Balinese accents, which achieves an eclectic or thoughtful look. All the rooms offer wheel-chair accessibility and open up onto the villa terrace through sliding glass-walls, allowing the sunlight and sea breezes to flow through the open-plan room. The exposed wooden-beams in the vaulted ceilings stretch above the 2 sitting areas, the indoor bar, the cozy dining area along with a pedestal table. There is also a breakfast bar and fully-equipped kitchen. 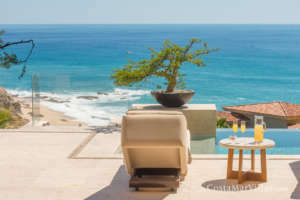 The 6 six bedrooms in Casa La Laguna offer en-suite bathrooms and each room offers outstanding views of the ocean with either a terrace or balcony that faces the water. Two of the rooms are honeymoon-worthy that feature king sized beds, while the other 4 rooms have queen sized beds. This villa makes you feel like you are in living in your very own resort, along with direct accessibility to the stunning beach. This vacation offers you with comprehensive services, along with a host of activities. You can book one of the fishing charters at the marina or schedule tee-time at the Greg Norman and Jack Nicklaus golf courses or enjoy horseback riding or ATV. Other activities include enjoying the tropical fish while snorkeling or if you are feeling adventurous why not try out one of the surfing lessons. 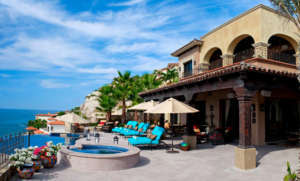 High-end shopping and world-class restaurants are a short drive away in downtown San Jose del Cabo. If you are looking for an exhilarating night out on the town drive into downtown Cabo San Lucas.